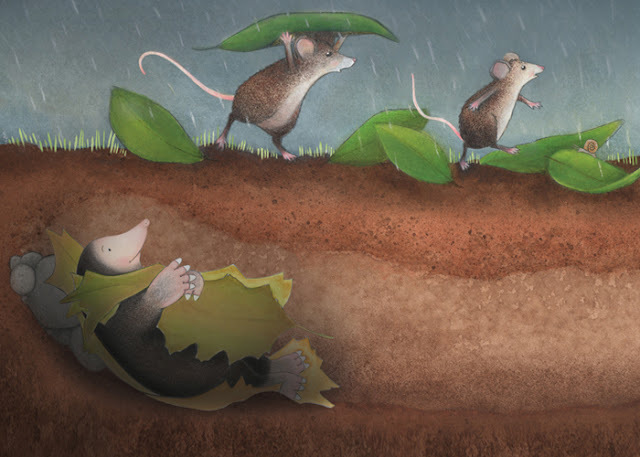 We are pleased to present picture book author-illustrator Nancy Armo today! Her debut, A FRIEND FOR MOLE (Peachtree Publishers), came out on March 1. Be sure to enter her giveaway for a copy of the book, a bookmark, and an 11" x 17" READ poster, printed on archival paper! Tell us about your background and how you came to write and illustrate for children? I was an arty kid growing up so when I went to the University of Washington I stayed on that track and graduated with a degree in graphic design. I jumped into the corporate world with a design position at Hewlett-Packard. I worked at HP for several years as an art director and then publication manager. After HP, I worked as an art director for an architectural firm, and later with an industrial design firm doing package design. It was after the birth of my children and reading picture books to them that I got the bug to illustrate and write picture books. I began dividing my time between freelance graphic design jobs and illustration classes, attending SCBWI conferences and writing workshops in pursuit of my goal of getting published. I didn’t feel ready to submit work to editors and art directors until after the SCBWI-LA conference where I received a portfolio honor. (Thank you SCBWI for that big push!) The learning never stops and I’m still taking classes and attending workshops to improve my craft. Congrats on your debut, A FRIEND FOR MOLE. Tell us about this story. How did it start? How long did it take you to complete? 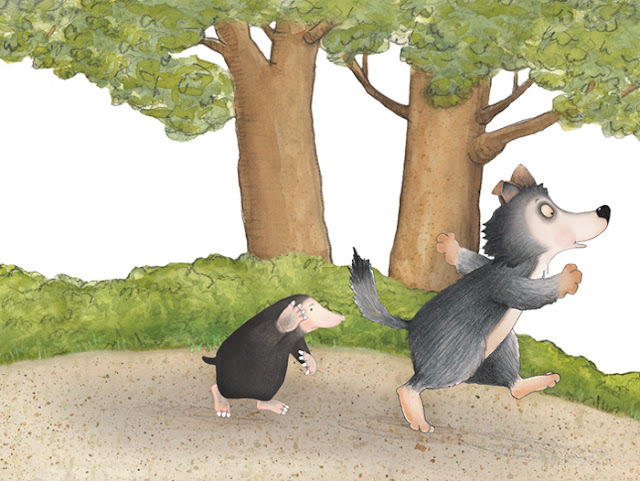 A FRIEND FOR MOLE is about a mole who gets lost and suddenly views the world as a frightening place. He unexpectedly meets a young wolf who is also lost and scared. Together they find they can help each other, demonstrating that individuals who are very different can become friends. Differences can make a friendship stronger. I knew I wanted to write a book about friendships. Originally the story was about a wolf who was having a hard time making friends because well… he was a wolf. Eventually he met a mole with bad eyesight who didn’t realize his new friend was a wolf. After submitting this manuscript, rejection emails came back, noting there were already too many misunderstood wolf stories on the market. One editor who liked the characters asked if I would consider flipping the storyline. That is, keeping the same characters but making mole the center of the story. So off I went in a new direction trying to figure out the common thread. Then I remembered something my son had said: “Everyone is scared of something and it helps if you have a friend by your side.” The storyline came to me. Sunshine would be scary for a mole since he spends most of his time in dark tunnels, while a young wolf might be scared of the dark if he is out at night for the first time. 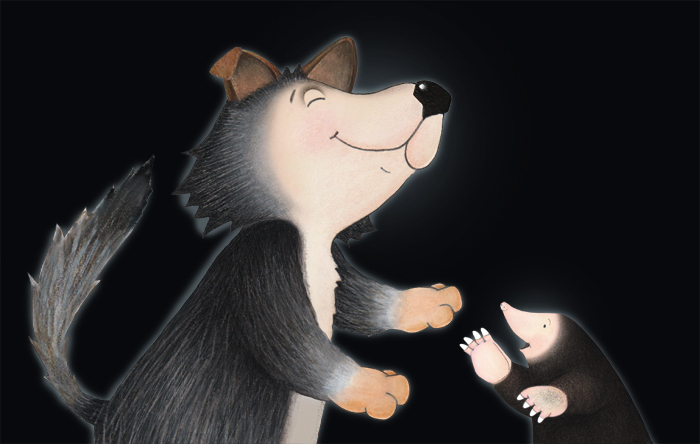 But a nagging question lingered… wouldn’t a wolf just want to eat the mole? This is where research revealed that wolf pups start taking short trips outside their den when they’re only 3 weeks old, but don’t start eating meat until 2 months. This gave me a timeline that fit a lost little wolf who might need the help of an unexpected friend like mole. The whole process from start of the original story to contract signing was three years. I find that it is good to have several projects going on at the same time especially when they are in the developmental stages. Sometimes you need to step back from a story, let it rest, and then come back to it with fresh eyes. Right now I’m finishing up two manuscripts/dummies with a humorous take on what happens when you don’t pay attention to what's going on around you. The hardest part of my job is keeping the final illustrations as fresh as the sketches and not overworking or tightening up. It is a tricky dance. I try to adhere to the mantra that less is more. Maybe not the easiest but definitely the most fun is character development. I often create characters long before there is a story for them. Putting them in different activities, interacting with other characters, and conveying different emotions and expressions helps create backstories that pull things together for a storyline. What has surprised you about the publication process? That it takes so bloody long to get a book published. From the time of signing the contract to having a physical book in hand can take years. I now understand some of the reasons for it but it still astonishes me. What advice would you give to aspiring illustrators or writers? 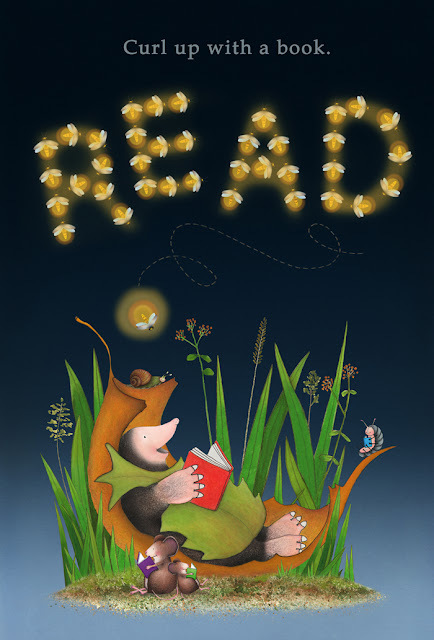 Read lots and lots of children’s books. Study effective layout compositions and understand why they work. Look at color palettes, drawing techniques, and typefaces. Being aware of what’s been done in the past can help generate new ideas to help move your work forward. Editors are looking for something new and interesting not more of the same. I love bagpipe music. I would love to learn how to play someday. Right now I have close neighbors so it would be hard to practice without disrupting their peace and quiet. So I am content to listen on my headphones and crank up the sound. 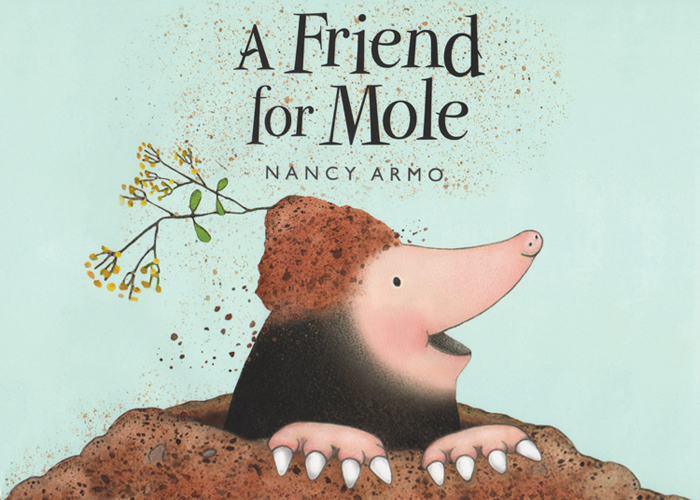 Nancy Armo is the debut author/illustrator of A FRIEND FOR MOLE published by Peachtree Publishers. The illustrations in the book are a mix of watercolor, Prismacolor pencils, and soft pastels layered in Photoshop. Nancy writes, draws, and plays in New Suffolk, NY where there are lots of moles happily digging up her garden. Great post, congratulations and thanks for sharing your story! Thank you, Rosie! So glad you enjoyed the post. These illustrations are so, so cute! And I love that you did research into wolf pups. Sue, thank you! Research is fun. You never know what you will discover! Congratulations, Nancy! 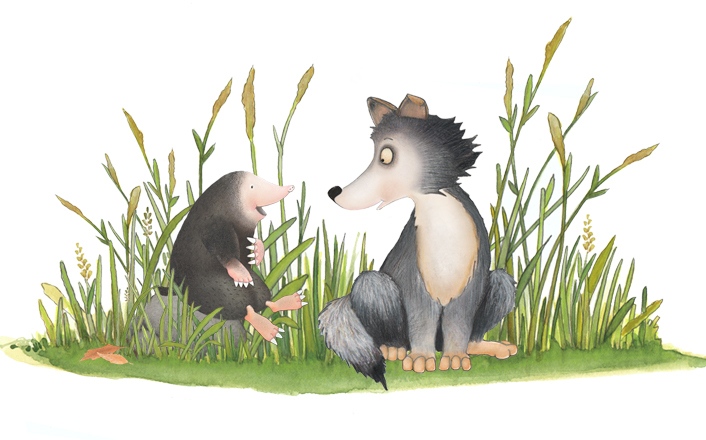 The illustrations for A Friend For Mole are beyond adorable. Robin! Thank you. Love your new book!! Congratulations, Nancy! Thanks for sharing the background on your book. Looking forward to reading it! Congratulations, Nancy! The book looks darling. I adore this mole--so cute!! Congrats, Nancy!! Nancy, I'm so happy for YOU and MOLE!! Congrats, congrats, congrats!!! Mary, my dear friend, thank you! Awww, brilliant way around the "wolf problem"! And I find it so funny that there are "too many misunderstood wolf stories" out there. The final version looks like a wonderful book. Congrats! Jilanne, who knew that misunderstood wolves were such a hot topic! I've been enjoying Nancy's art on FB and can't wait to read Mole! Congratulations on the be but book! Teresa, thank you! I've enjoyed your art on FB too!! Thanks for the post. The illustrations are so cute! Nice interview. I love this book. Congratulations Wendy. The story sounds wonderful and the illustrations are precious! Congratulations! And I've been reading from so many author interviews how long the whole publication process takes from start to finish. Here's to developing lots of patience! Kristin, the process is long and can be a bit frustrating but stick to it! It's worth it. We need your stories. Nancy, I love your illustrations! Thank you for sharing your process too. I've worked at HP as a writer. But writing picture books is so much more fun! I look forward to reading A a Friend for Mole! Linda, so nice to hear from another HP person! You're right writing picture books is way more fun. This book looks utterly charming! ...bagpipe music, eh? Hi Nancy! I'm an illustrator from South Africa and just thought to say that this book looks really amazing. I am always so impressed with people who can illustrate and write the book - I always loose steam half-way though. Nancy - Your story is adorable. I'm printing out your wonderful writing & illustration tips. Thank you for a delightful book... and your honesty! Valuable insights. I loved hearing about the background of your story. Nancy, congrats on your debut book! I loved meeting you at your SCBWI-LA honor win conference and I'm super excited to get my hands on a copy of your book. Congratulations on your success!! The book sounds adorable and thank you so much for sharing your thoughts in this interview....well done! BRAVO! Congrats Nancy! Wishing you much success! Loved hearing how you started! It is a great storyline that children/parents can relate to. Definitely going on my to-read list. 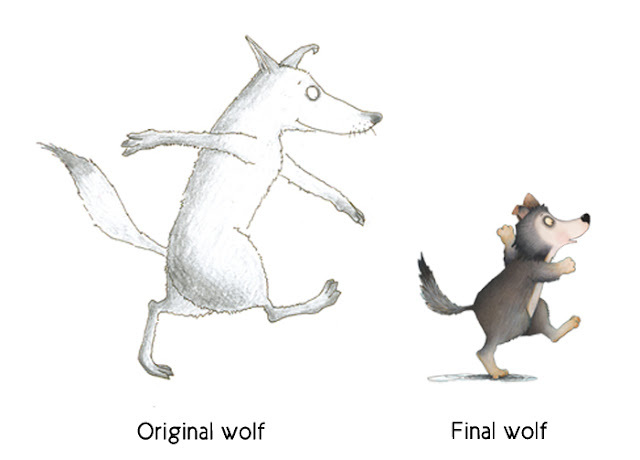 Your characters are so cute and I definitely love the final "wolf" from the start. Congrats! Love how flipping the characters made the book work. So simple. Wonderful picture book and interview! Thanks, Nancy and Kidlit411. If I don't win the giveaway, I'd love some bookmarks for my Little Free Library Walnut in CA.